Outdoor string lights are great for decorating an outdoor party because they are lightweight and inexpensive. Another great light fixture to use are paper lanterns (DIY Paper Lanterns: Our 5 Favorite Posts). 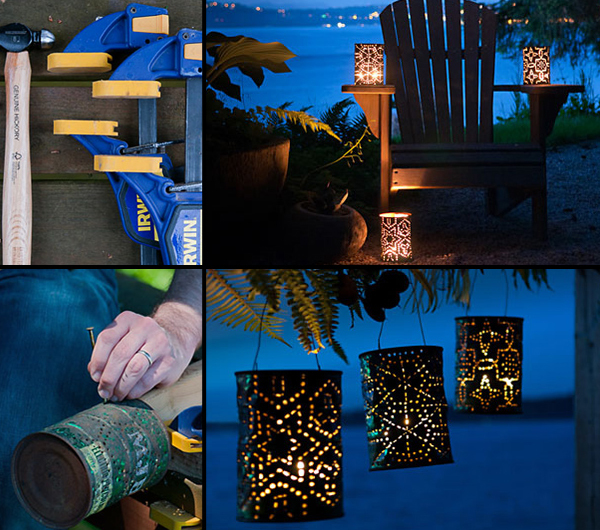 Here are a few ideas on how you can create unique shades for outdoor string party lights and different ways you can use them to decorate an outdoor space. 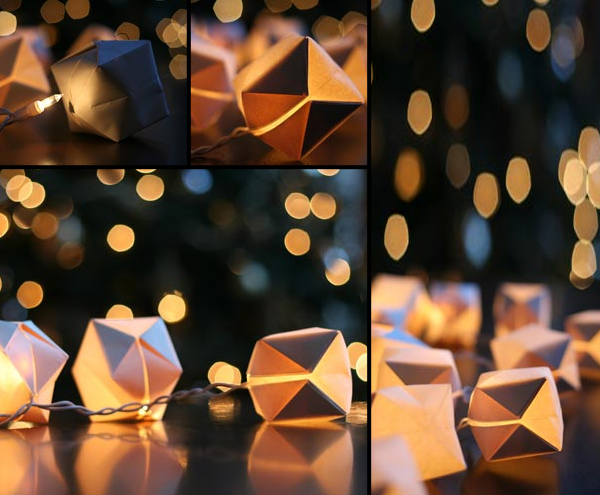 Over at the Wit and Whistle website, they have created paper origami shades to cover LED string lights. The great thing about this idea is that you can create any sort of origami shapes from hearts, to flowers and fit them onto the string lights. 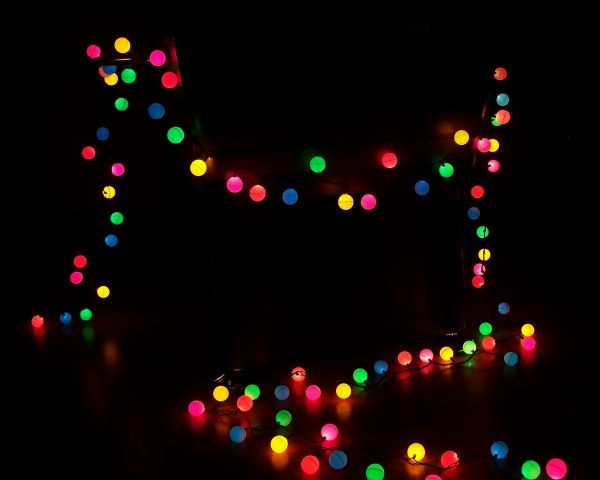 LED string lights were used as they give off less heat – link. 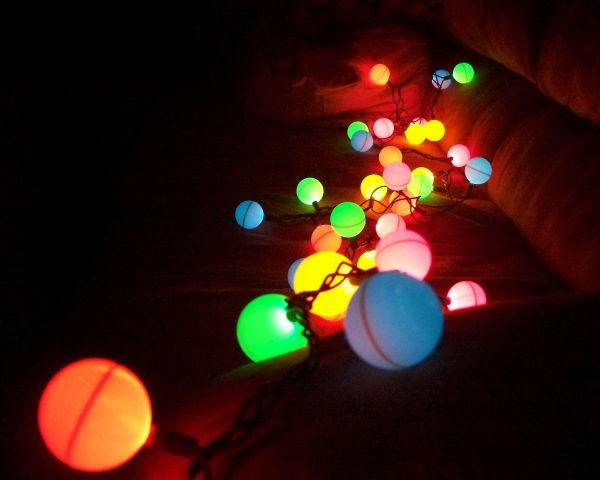 Steven over at Instructables has taken plain colored ping pong balls, and multicolored string lights to create these colorful DIY string lights –link. Create party lights by using Dixie cups and scrapbook paper to create a garland – link. 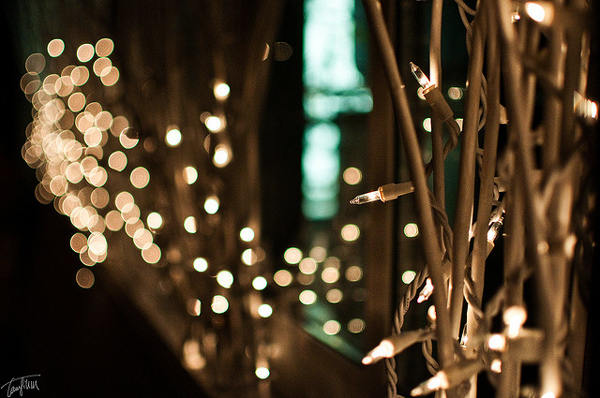 There are a number of ways you can use string lights to decorate an outdoor party. They can be simply wrapped around railing, trees, or hung over fences or bushes. You can create a curtain of lighting by hanging a number of string lights side by side. Another idea would be to hang string lights in rows overhead which will create a starry night effect. They can be hung overhead either from the walls of the house, from trees, or plant a pole into the soil to hang them from. If you hang the string lights upwards onto a pole you can create a nice canopy/tent effect. You can easily create festive and colorful party lights by putting glow sticks or battery powered LED lights inside of balloons and blowing them up. 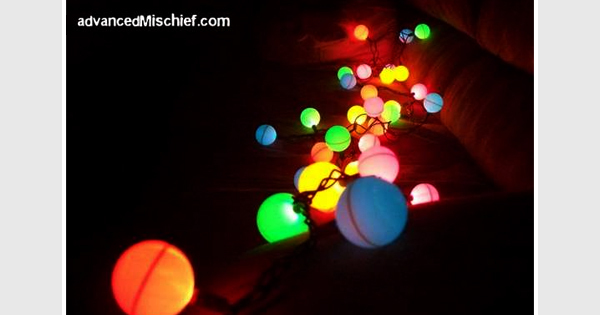 These glowing balloons can then be scattered around outdoors (they will even float in pools). Or if you want to go a step further, look to rent a helium tank and buy helium specific balloons from a party store to create floating glowing lights, which can be tied down around the backyard. Paper lanterns are a popular choice for DIY lighting projects as they are so inexpensive and lightweight. The second most popular light fixture to use in DIY projects are string lights – another light weight and inexpensive light source. I have featured the work of Wit and Whistle and their Origami Sting Lights. This time Steven over at Instructables has merged together string lights and ping pong balls to create a colorful array of lights. 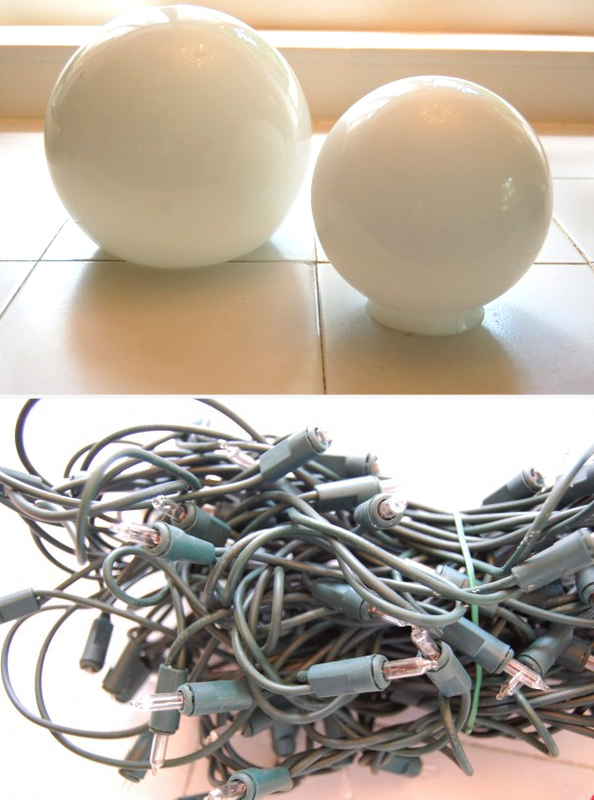 All you’ll need for this DIY project are string lights, ping pong balls, a glue gun and a drill – you can find the step by step guide here. 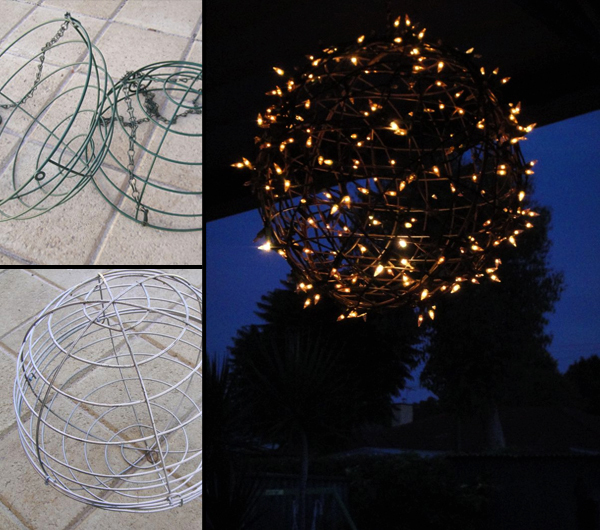 Karen over at The Art of Doing Stuff has come up with a unique, simple and stunning DIY outdoor lighting idea. Using only opaque glass shades commonly found at secondhand stores for $1-3 (also available at hardware stores for $10-15) and old used string lights, she has made these decorative glowing orbs. There is really nothing to it: stuff the lights into the shades, plug them in and your done – all for $3. You can even use solar string lights and avoid the wiring completely. Or they would make for wonderful table lamps. We’ll be trying this out soon – maybe even applying a thin layer of green coating on the orbs to make them blend in with the plants during the day. String lights are such a versatile lighting option. They are easy to put up and are inexpensive to buy. There are even solar powered versions – allowing you to hang them anywhere around the deck and making it even simpler to install. 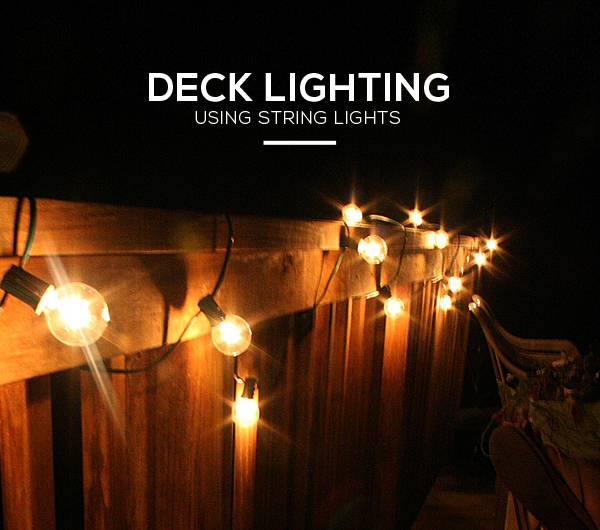 Here are a few deck lighting ideas using string lights. One lighting idea using string lights is to hang them over the deck. They can be attached from the wall of the house to a tree/pole/or an arch. If you use the small light bulb string lights, you will create a starry night effect over your deck. Hanging a number of string lights side by side will create a curtain of lighting. This can be used on the walls of the house or on any overhanging beams there might be on your deck. Maggie Makes has a tutorial here on how you can make elegant coffee can lanterns. In their tutorial they use candles to light the cans, but you can replace them with solar powered string lights. Place the cans outdoors where the sun will reach the string lights inside. The Blue Shed has a tutorial here on how to make an outdoor pendant light using hanging plant baskets and string lights. There is such a wide range of choices when it comes to string light styles. You have the traditional red and green Christmas lights and there are the orange and white ones that are ideal for year round use. More decorative ones are available such as French Café Globe string lights, or Japanese paper lanterns. There is always the option to make string light origami shades as seen in the post here. String lights. We’ve seen them hanging in gardens, used to decorate weddings and town streets, we’ve even seen them in wine bottles (DIY wine bottle lamp). They turn a space into an enchanting setting. There are a number of ways to use them: wrap them around posts or trees, hang them side by side to create a curtain, or hang them acorss overhead to create a starry night effect. You can see all the different ways they can be used here: L+L LOOK BOOK: Beautiful Uses Of String Lights [Photo Gallery]. 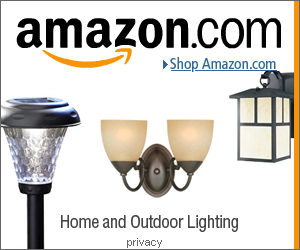 Now we can add another use for string lights, creating outdoor pendant lighting fixtures. Over at from the blue shed they have created such a simple and elegant pendant light using outdoor string lights and hanging basket frames. 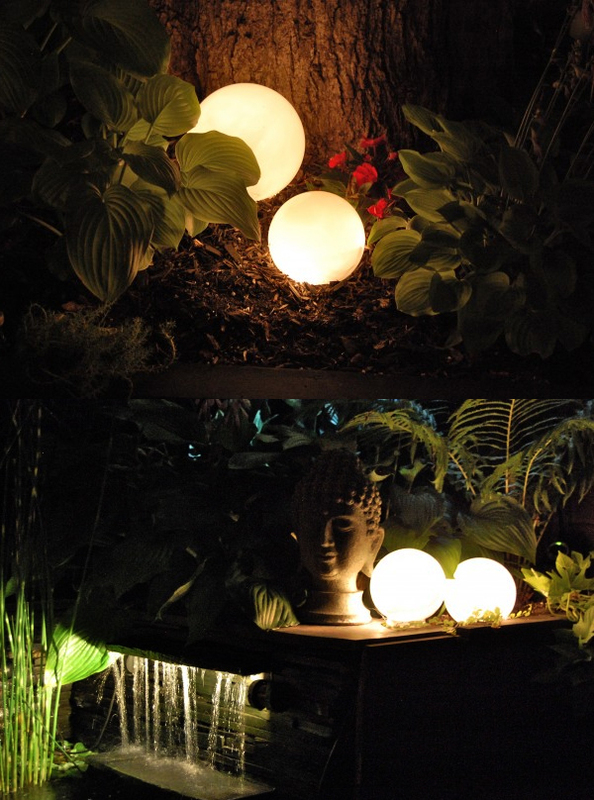 These outdoor pendant lights will turn any garden into a fanciful place. They are ideal as deck lighting ideas too. For the step by step DIY tutorial on creating these outdoor pendant lights head on over to: Fairy Light Globe DIY. Here is such a simple, creative and inexpensive DIY lighting project. Taking normal outdoor string lights, or LED versions as they produce less heat, and diffusing the light by adding origami shades. These lights will be ideal for creating enchanting indoor decorations – or if you can find waterproof paper, they can be hung outdoors. The glowing cubes that Wit & Whistle has made here are beautiful minimalistic shapes. But there are so many possibilities in creating other decorations – using different origami designs. Head over to Wit & Whistle to check out the step by step guide in making these lights.